I spend a lot of time grooming and taking care of my furs so I can look handsome and cute. All that hard work is worth it with even one comment from a ladycat that thinks I'm handsome, but have you ever wondered if I'm cute on the inside too? When I asked Mommy what she thought, she said being cute on the inside means that I have a good personality and she says that I do, but that's not what I meant. I mean really on the inside - what do I look like? Because I was so curious, Mommy asked our favorite vet if he could show me and he gave Mommy an x-ray from last year when he wanted to see my insides. I guess it's obvious - I'm cute on the inside too! You are very cute inside and out! And clean and handsome! Oh Samson, us ladycats think you are super handsome, you have a sweet purrsonality and you have cute insides! You are the purrfect Mancat! 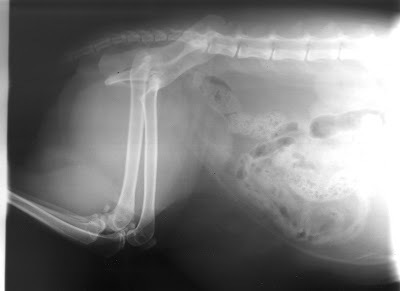 I have some x-rays too, and I look as sleek and gorgeous inside as I do outside! I guess who swoon for your handsome on inside must be All lady veterinarian !!!!!!!!!! Awwwwwww adorable Samson!! Me and Charlie just knew you were perfect from the inside (literally!) and outside too! Yay!!!! Oh Samson, you are the best both on the inside and on the outside. We kind of like the outside better with all those pretty furs of yours. All the ladies here think you are the most handsome. Take care and have a great week. We like your outside best cos it's got all that beautiful fur on Samson - inside is ok but not nearly as gorgeous and floofy. We didn't need to see your x-ray to know that you are cute inside and out!!!! We already knew that...but we do prefer your floofy outside...if we have to make a choice. LOL! You *are* super-handsome, Samson, though we, too, prefer to look at your outside. Haha. Not that you needed it, but the evidence proves have handsome and cute inside and out! Sampson...I am romantically attached or I would have told you how handsome and mancatly you are. Ooops, I just did. Samson, buddy...we think you are cute on the inside, too...and a little boney!! Haha!! There is an old saying "Beauty is only skin deeo, but Ugly goes clear to the bone!" Your xray shows you are beautiful inside and out. We are new visitors foe Marges. We are Chloe and Cecil two Burmese fur babies. Woops, mom is trying to type with one hand and drink coffee with the other..Deep not Deeo! Handsome and sweet Samson....you are handsome inside, outside, and on any and every side!!!!!!!!!!! Of course yoo are cute! Fact! Samson! Your innards are very, erm, nice. We have to admit we're partial to the outside, especially your handsome long furs...hubba hubba! Yep, Samson, you are indeed cute on the inside too. No question about it Samson. YOU are cute through and through! Awwww this made my mommy smile! She said you are cute "inside, outside and all around the town!" Cutie is in the eye of the beholder and you are a cutie pie!